This medication is used to prevent certain types of chest pain (angina). It may allow you to exercise more and decrease the frequency of angina attacks. Nifedipine belongs to a class of medications known as calcium channel blockers. It works by relaxing blood vessels so blood can flow more easily. This medication must be taken regularly to be effective. It should not be used to treat attacks of chest pain when they occur. Use other medications (such as sublingual nitroglycerin) to relieve attacks of chest pain as directed by your doctor. Consult your doctor or pharmacist for details. Older adults should discuss the risks and benefits of this medication with their doctor or pharmacist, as well as other possibly safer forms of nifedipine (such as the long-acting tablets). Take this medication by mouth, usually 3 times daily with or without food or as directed by your doctor. Swallow this medication whole. Do not crush, chew, or break the capsule. Avoid eating grapefruit or drinking grapefruit juice while taking this medication unless your doctor instructs you otherwise. Grapefruit can increase the amount of certain medications in your bloodstream. Consult your doctor or pharmacist for more details. What conditions does Procardia treat? Dizziness, flushing, weakness, swelling ankles/feet, constipation, and headache may occur. If any of these effects persist or worsen, tell your doctor or pharmacist promptly. Tell your doctor right away if any of these unlikely but serious side effects occur: fast/irregular/pounding heartbeat, fainting. Tell your doctor right away if any of these rare but very serious side effects occur: vision changes. Although this medication is effective in preventing chest pain (angina), some people who already have severe heart disease may rarely develop worsening chest pain or a heart attack after starting this medication or increasing the dose. Get medical help right away if you experience: worsening chest pain, symptoms of a heart attack (such as chest/jaw/left arm pain, shortness of breath, unusual sweating). List Procardia side effects by likelihood and severity. This medication should not be used if you have a certain medical condition. Before using this medicine, consult your doctor or pharmacist if you have: certain heart problems (such as congestive heart failure, aortic stenosis). Before using this medication, tell your doctor or pharmacist your medical history, especially of: liver problems, kidney problems. What should I know regarding pregnancy, nursing and administering Procardia to children or the elderly? Other medications can affect the removal of nifedipine from your body, which may affect how nifedipine works. Examples include cimetidine, enzalutamide, St. John's wort, rifamycins (such as rifabutin, rifampin), drugs used to treat seizures (such as carbamazepine, phenytoin), among others. Cimetidine is a nonprescription drug that is commonly used to treat extra stomach acid. Because cimetidine may interact with nifedipine, ask your pharmacist about other products to treat extra stomach acid. Does Procardia interact with other medications? Should I avoid certain foods while taking Procardia? Laboratory and/or medical tests (such as blood pressure, liver/kidney tests, electrocardiogram) may be performed from time to time to monitor your progress or check for side effects. Consult your doctor for more details. Do not flush medications down the toilet or pour them into a drain unless instructed to do so. Properly discard this product when it is expired or no longer needed. Consult your pharmacist or local waste disposal company for more details about how to safely discard your product.Information last revised May 2017. Copyright(c) 2017 First Databank, Inc. 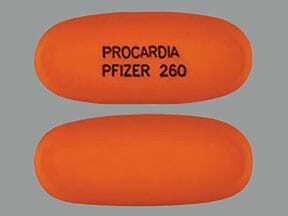 This medicine is a orange, oblong, capsule imprinted with "PROCARDIA PFIZER 260". Are you considering switching to Procardia? How long have you been taking Procardia?